Saludos from Panama, this is a special news bulletin blog post that I am writing from Panama, I’ve been through lots of adventures in the last 6 weeks that I still need to blog about but when the adventures are abundant it gets tougher to find time to blog about them. Anyways, my most recent adventure is such a story that I’m going out of chronological order here to tell the tale while its still fresh in my mind. For those of you who want the details skip the text in blue and begin reading the text in italics right now (Will take about 15 minutes). If you don’t have 15 minutes, the blue text below is a very summarized summary. For those who don’t have 15 minutes for the full story, the short version is this. About a week ago I hitched a ride on a sailboat heading from Colombia to Panama with hopes to hitch another ride from Panama to Cuba. 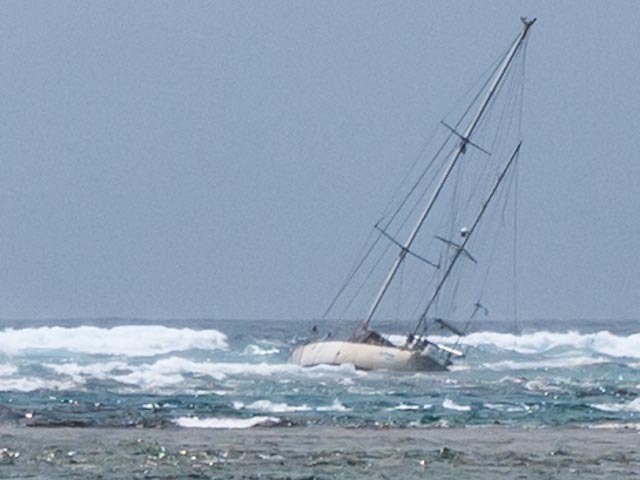 After 80 hours at sea we shipwrecked in the middle of the night off the coast of Panama. Yea, full-on. There were about 10 minutes that might have been some of the most intense of my life but in the end the situation could have been MUCH worse and nobody died or was injured. Some Indian fisherman saw us and rescued us and brought us to a deserted island, then the Panamanian Coast Guard picked us up and took us to the mainland. If you want to hear the details read below. If you want to listen to some music while you read, this song randomly came up on my ipod as we set off across the Cartagena Bay and from now on I will always associate it with the memory of that moment that began this adventure. Its is a piece by one of my favorite composers, Phillip Glass. There is something magical and light about the piece, but at the same time it seems to have a foreboding undertone, qualities that in retrospect suit the story quite well. It’s nighttime and the motorless little dingy boat is slipping quietly through the shiny black water of the Cartagena bay. The moon is almost full and I can see the faces of the men piloting the little boat. 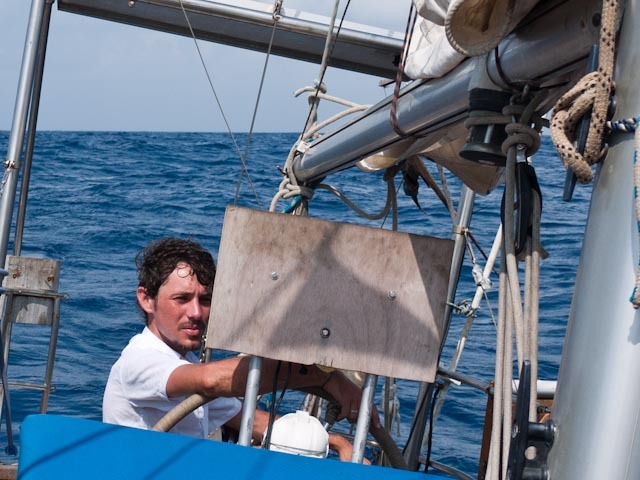 Jose is from Spain, he’s the captain of La Sierra Madre, the 45 foot sailboat that is anchored about 150 meters ahead of us. This is the boat that I would spend the next 80 hours on until it would eventually crash into a reef leaving me and 6 other people on board with a near death experience story to tell. Jose is in his late 40’s and has the look of a man who is either dishonest or just naive. He’s at the bow of the little boat holding a paddle in his hands while giving sharp unnecessary orders to his first mate Tilson. Tilson is at the rear of the dingy paddling us towards our ship. He’s Colombian, originally from Cali. His heavily creased black skin, his eyes bloodshot, the sunken features of his face, and the front teeth he is missing tell a tale of a rough life. All the same he had a positive energy and I was glad he was going to be aboard. This was never in my plans. Plans….they are fun to make when you are traveling, but even more fun to break. I was trying to get to Cuba. 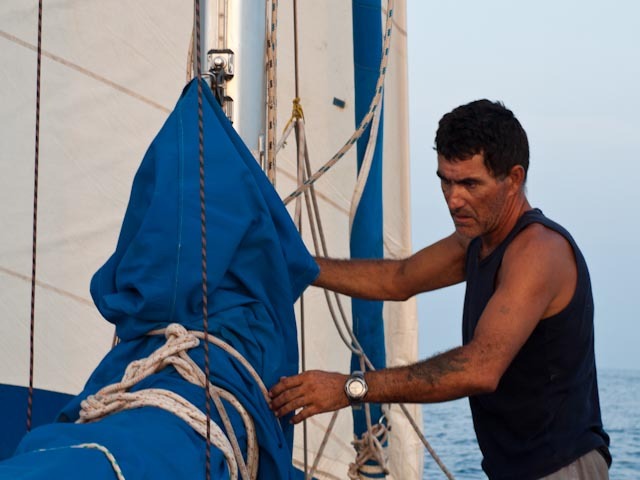 When I arrived in Cartagena from Medellin I spent a day wandering around the marinas asking around for private sailboats heading in that direction hoping to find one that had an extra berth and was looking for a deckhand. It became clear pretty quickly that I wouldn’t find one, the winds don’t head that direction I learned, but several people I talked to had suggested trying to get to Panama. They said from there I might have a better chance of hitching a ride to Cuba. I had already been to Panama years ago, about 4 months into a year long trip through Latin America. It was a nice enough place but I had no desire to return unless it was going to get me closer to Cuba, which apparently it would. So when Jose appeared at the marina one day and offered me a ride to Panama I took it. 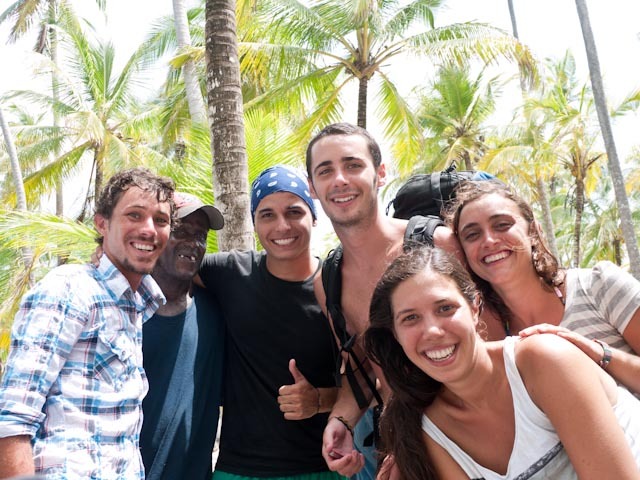 Most backpackers pay $400-$500 for the 5 day long trip which is supposed to include a few days sailing around and exploring the San Blas Islands off the coast of Panama. 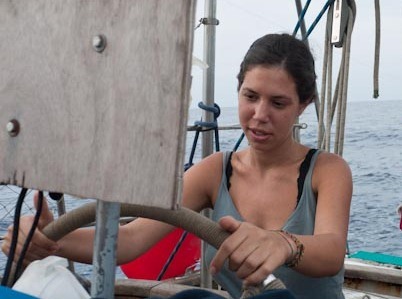 There is a whole cottage industry based around shuttling backpackers between Panama and Colombia on sailboats. 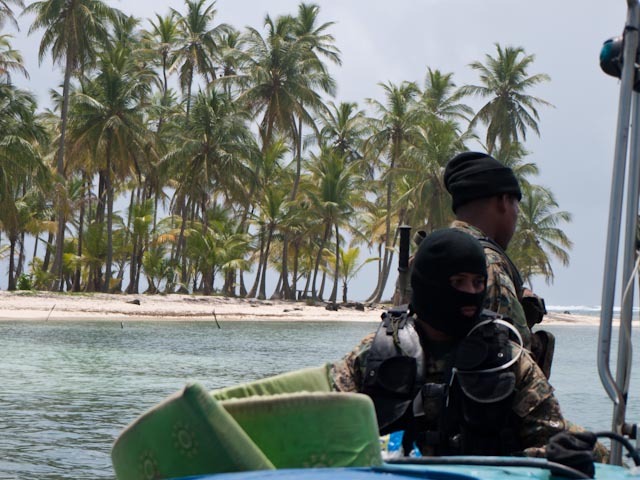 Since jungle and armed and dangerous narco-traffickers make it impossible to cross from Colombia to Panama and vice versa by land, lots of backpackers opt out of flying and instead choose to sail. Jose was not part of this cottage industry, in fact he had never sailed this route before, he just saw it as an opportunity to make a little money on the side by taking on some paying passengers. The dingy had almost reached our boat when the other passengers emerged from the hull and appeared on the deck to help us unload the dingy of the supplies we were carrying. These other passengers were backpackers in their 20’s. There were three Argentines, Tracy, Julia, and Javier and a Colombian named Martin, originally from Cali but who now lived in Panama. We unloaded the dingy and went to work putting things away and organizing…our departure had already been delayed several hours so we were in a hurry to get going. 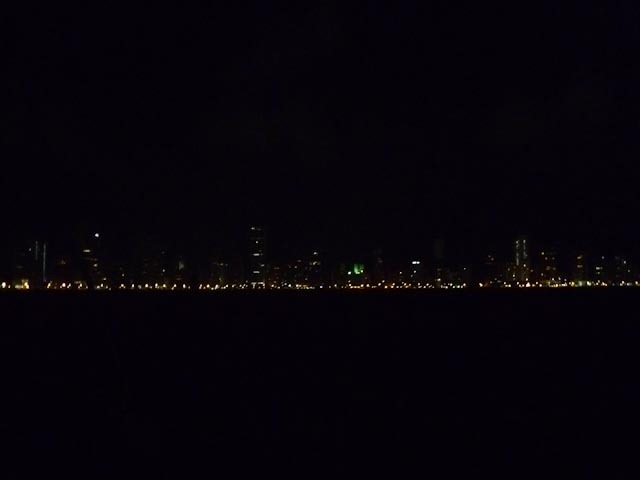 At 8:15pm we pulled anchor, started the motor, and off we went cruising through the calm black bay waters watching the Cartagena skyline recede behind us. The mood on the boat was festive and light. We were all happy to finally be on our way, on our way to Panama, to islands, to sun, to adventure. An hour later though we were out of the bay and into open waters; no more calm bay waters, this was the real deal. The small swells of the open ocean pushed and pulled, and the light of the moon passed over the water with an ease and grace that La Sierra Madre was not capable of. An instantaneous change in mood swept over the four other passengers. Cigarettes were extinguished, cups of rum set down, and conversations fizzled into non-existence. Seasickness and its bastardly effects had crashed the party like a silent force. Everyone settled into their sleeping spots and closed their eyes hoping for sleep to arrive. I felt fine, in fact I felt great. I carefully made my way to the bow of the boat where the bobbing and bouncing effects of the swells was exaggerated to an extent that it seemed absurd and impossible. I sat there alone watching the sky and the horizon and that feeling that I am always seeking came to me. The feeling of being quite alive and surrounded by adventure. It’s a feeling that always makes me smile to myself. It’s a feeling that would remind anyone that life is good, it is a gift. The next few days were passed inching our way through open seas. The wind was not behind us, or ahead of us for the matter, it was nowhere to be found. The passengers seasickness made conversation amongst us short and sparse. I felt bad to see them in such a state but there was nothing I could do. Jose, our captain, came under scrutiny by me and the rest of the passengers, including his first mate Tilsen, from the second day. He made an effort to be a good captain, responsible and hospitable to the needs of the passengers, I’ll give him that…but it just wasn’t in his nature. His personality clashed with just about everyone on board and the bickering began quickly. He acted irrationally choosing not to start the motor even when the wind died completely and we began to drift backwards. The trip on open ocean that was supposed to take 48 hours was on course to take 90 hours. It wasn’t long before the word mutiny was making its rounds, although to some it was in jest, I know there were others who, if they had possessed more sailing experience, would have been making serious plans. I kept a close eye on all this but was also determined not to let it ruin the trip. We were going slow but we were heading in the right direction. Yes Jose was difficult but se la vi. We had plenty of food and water, so if it took a little longer to arrive and I had to deal with a little negative energy on board then so be it. I never actually thought that something could go seriously wrong. Piloting duties were shared between me, Jose, and Tilsen in two and a half hour shifts. Piloting was an easy job. My instructions were simply to keep the boat on its bearing, stand up every ten minutes or so and scan the horizon for the lights of other boats, and if the winds changed direction to wake up Tilsen or Jose. I liked being on my shift, especially at night when I was alone with the ebb and sway and the stars. The feeling of adventure and of being alive and the excitement it produced mixed with the calming effect of the waves and the breeze in such an intoxicating way that I never wanted my shifts to end. 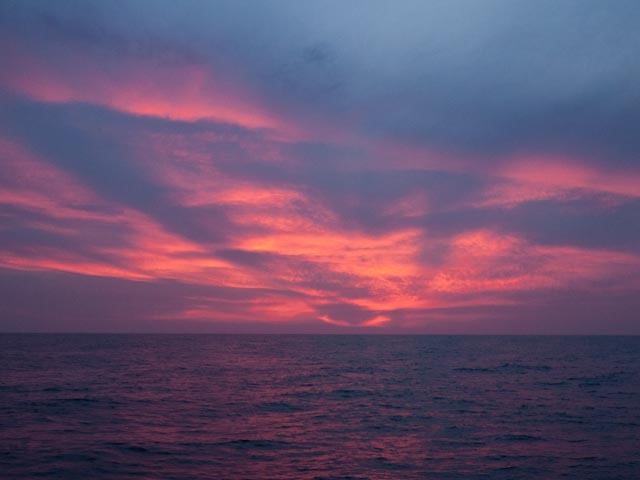 It was on one of these nights, our fourth night at sea that Jose woke me up at 3:45am to begin my shift. 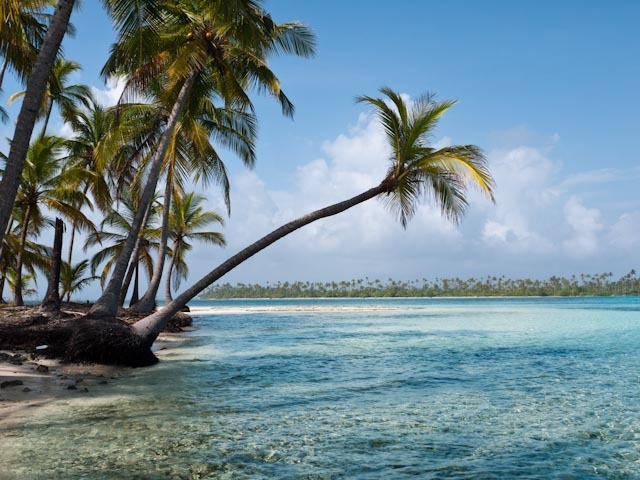 I looked at the GPS and saw that we were getting close to our destination, Caye Holendese, one of the San Blas Islands off the coast of Panama. But the GPS only shows the coastline, not small islands, so I asked if I needed to worry about land, if there were any islands on the horizon. He said we had about 4 hours to go before reaching the islands. That land was far away my shift would long be over before we needed to worry about that… just keep the ship on course, he would take over in an hour and a half. He stayed with me for ten minutes or so and then went below to catch some sleep. Forty five minutes later I was fully wrapped up in one of my joyful moments admiring the sea and the night and standing at the till. The moon had already gone down. There was no light whatsover – the boat was sailing through total darkness. All of sudden a rather large swell rocked the boat. This was kind of unusual but happened from time to time when we were at open seas. Then, 5 seconds later I looked to my right and saw a huge wave crested with white water heading straight toward me. Not towards the boat, but more as if there was a target painted on my chest. I knew this was bad. I screamed Tilsen’s name and held on to the wheel with both hands waiting for the beating I was about to take. The wave dumped a thousand gallons of water onto the deck and rocked the boat so hard that I could hear all the silverware, pots, and pans come flying out or their locked cabinets below. Tilsen began to scream bloody murder in is rough salty voice through his missing teeth. He was screaming the most panicked terrifying screams that you could could imagine. “NOS CHOCAMOS! NOS CHOCAMOS! ARRANCA EL MOTOR!” (We’re wrecking! We’re wrecking! Start the motor!). Jose went for the motor to try and start it. In the meantime the ship was getting bashed around like a toy at the will of an angry kid. Tilsen had taken the wheel and was trying to point us into the waves which were crashing over the deck of the boat and rocking it so far on its side that I was sure it would flip. The motor didn’t start. It wasn’t going to start. And then rocks came. Along with the sound of Tilsen’s terrifying scream, the sound of the boat hitting rock will go down as two of the scariest sounds I have heard in my life. It began with a WHAM!!! As the boat smashed against a rock and then followed by the sound of scraping metal as the wave pulled the boat off of the rock it had just smashed us into. To endure this sound once was enough, but it happened again and again and again. We would be rammed up against one rock until a swell dislodged us and we were smashed us up against another. Standing on the deck, holding on with both hands so as not to be knocked overboard by a huge wave or 1000 gallons of water I listened to this smashing noise wondering when it would end, and whether when it ended, what would that mean for us? Down below there was lots of praying and crying going on. Above we had our hands full. Surely the boat was already taking on water. At this point my only thought was that we were still several miles away from land, that whatever was happening here was of epically dangerous proportions. That with waves like this broadsiding us, with the boat being smashed up against rock after rock, there was no way we were successfully, all seven of us, going to get out of this boat and into a tiny dingy, in these conditions of whitewater waves and rocks. There was just no way. My mind dropped the idea in a second and moved onto the next. We needed help. If we are going to go down out here, someone needs to know we are here, wherever here is. We need to get help on the way. Jose was still trying to start the engine below when I made my way to the hatch “JOSE! El RADIO! EL RADIO! LLAMA POR RADIO!” The engine was never going to start so he left it and jumped on the radio and began the SOS call. He held the receiver up to his mouth and shouted “MEYDAY MEYDAY! Es el barco La Sierra Madre, tenemos una emergencia! 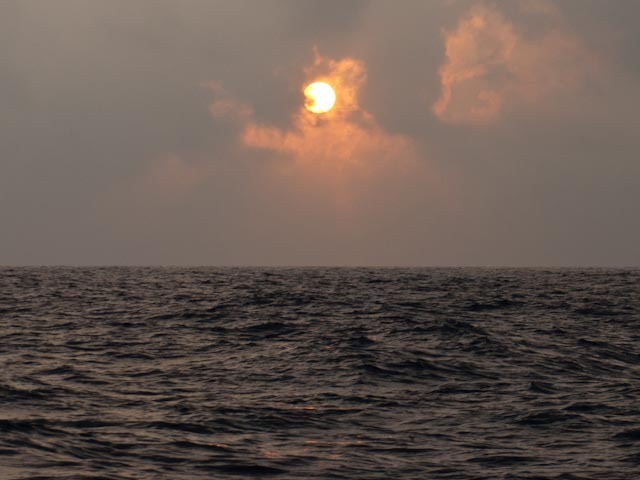 MEYDEY MEYDAY!” As if the situation was not already extremely real, for some odd reason hearing our captain shouting Meydey into the radio made the reality of it all reverberate in my mind, and I hoped across the seas. But there was no response. Channel after channel…nothing. 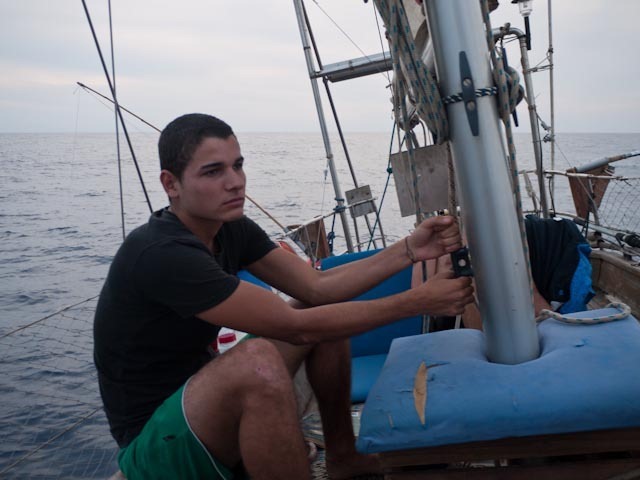 Jose threw me some flares and while he kept trying the radio I went back out to the deck, held onto the mast with all my strength and ignited the first flare which burst into a blazing red light. The blinding light caused a small feeling of relief…at least it was something. At least we were doing something to get noticed. But as with calling in Meydey over the radio, igniting that flare also made the reality of our situation hit home a little harder. Its something that you might see laying around a hundred times but you never thing you would actually be taking that plastic cap off and striking it lit. Once you make that Meydey call, once you strike that flare, its not a game, its very real. Back in the hull the water was beginning to come in through the bow of the boat, I knew this was coming but the sight of it still sent an extra urgency through my body. The radio was not working. “Who has a cellphone that works! ?” I shouted. Martin, the Colombian said he had a cellphone with a Colombian chip that would probably work here, but he had no battery. Tracy said she had a phone but the service was blocked so that it wouldn’t accept foreign chips. “What kind of phone is it?” I asked. “A Blackberry.” A flash of hope sprung up inside of me. “Is it charged?” I asked. I had a blackberry also, mine was out of battery but was unblocked. “Tracy, give me your battery, Martin, give me your chip!” I said. And like that we pieced together 3 phones and got an SOS signal! We called 911 and to everyone’s great relief within minutes we were talking to the Coast Guard reading them off our coordinates. By this time the waves seemed to have wedged us between two rocks, we were still being pounded by waves and the boat was rocking back and forth with the grinding noise of metal on rock reminding us of the gravity of our situation. Nevertheless we seemed to be stable, at least compared to the prior ten minutes that had lapsed since the first rogue wave. It was about this time that the sun began to illuminate the horizon and reveal to us our situation in clarity. There was a tiny island, not even the length of a football field, sitting only a few hundred yards away from us. We were wedged on a reef, surrounded by reef and white water waves. Jumping off the boat and swimming or trying to use the inflatable dingy were not safe options, the sea was too violent and the reefs too unavoidable. But at least we knew then that our situation was no longer dire, that worst case scenario we could make take our chances in the dingy and if need be could try to swim without being pummeled into the reefs. According to our captain we were far away from land, and that is what we had thought during the initial chaos of the shipwreck. From that moment on the panic subsided and we just faced out reality. We were relatively stable it seemed, the coast guard was supposedly on their way, the ship was filling with water, but everyone was ok and we were close to land. The sun rose above the ocean covering us with a beautiful golden light that noone had time or mind to notice or appreciate. We busied ourselves with various chores, throwing the dingy overboard and getting it ready in case we should need it, taking down the sails, throwing out the anchors to ensure we did not slip off the reef, and making periodic calls to the Coast Guard to ensure they were on their way. The boat was still getting rocked by large waves and as it began to lean more and more to one side there was some fear that a large wave could topple it over. A tank of gasoline had also somehow opened in the hull of the boat and the water that was now knee high stank of gasoline that could possibly ignite. These two fears we held close; but the light of day, the site of the nearby island, and our impending Coast Guard rescue kept everyone’s nerves in relative check. An hour and a half after the beginning of the episode we were wondering why the Coast Guard had not arrived when we saw a small boat heading our way from the nearby island. It was a homemade longboat, like a large canoe with a small outboard engine that was being piloted by two Kuna Indians. The Kuna is a tribe of indigenous Indians who inhabit the San Blas islands and the nearby coastline. They were fishermen and had seen the boat in the morning light being taken slowly by the sea. They knew the reef well, the crevasses and shallows and they carefully zigzagged through the reef through gaps that would only accommodate a narrow little boat such as theirs. By the time our rescuers had arrive the water was waist high in the boat. And there we found ourselves. Shipwrecked on a deserted island. Safe. Alive. Shocked that the last hours were not a dream, that the thing that could never happen to you had happened to us. On the bright side we could not have asked for a better place to have wound up. 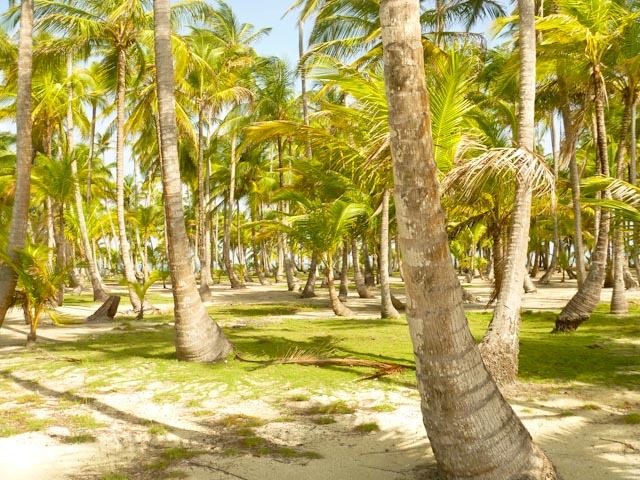 The island was a postcard; with translucent blue water surrounding white sand and coconut palms. You could throw a rock from one side of the tiny island and hit the shoreline on the other. It was stunning. And from the distance we could see the outline of the ship, slouching into the waves. It wouldn’t be long before the sea would take the rest of it. While of course we felt bad for Jose that he had lost his ship, everyone on board couldn’t help but be be angry that his mistake had nearly cost us our lives. 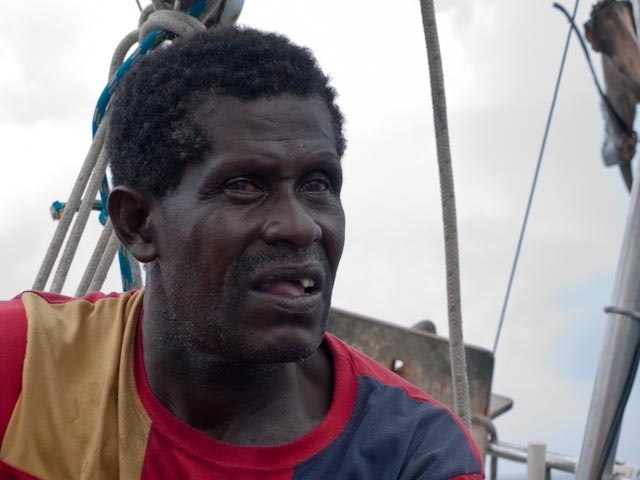 He had calculated that we still had hours left before we would reach the islands when in fact we had already been sailing dangerously close in the dark of night past the unseen islands for quite some time before the shipwreck. The Coast Guard arrived at the island about 3 hours after they received the distress call. Thankfully they brought their ski-masks and assault rifles. They offered to give us a ride to another island where we were to go through customs and answer some more questions about the shipwreck. And so we boarded their boat and waved goodbye to paradise, to the island that we would always remember as a our ray of hope. I’ll never forget the feeling of relief and salvation I felt when the sun had first lit up the horizon and I saw that island in the near distance. And now, as I sat on the coast guard boat in the blazing sun and watched the island grow smaller in the horizon, the feeling of being quite alive and surrounded by adventure swept over me again. Mauki, as seen from the Coast Gaurd rescue boat taking us to the mainland. So that’s our story. To see more pictures click here: MORE PICTURES. Although seasickness and shipwrecking had prevented me and the other passengers to get to know each other while on the boat, in the days after the shipwreck we made up for it by spending time together in Panama City. I lost a lot of belongings in the shipwreck, including a camera that was full of videos and photos I had taken from the beginning of the boat trip through the rescue. Fortunatly I had taken some pictures with my other camera and Julia and Tracy also had some so that I had these pictures to share here on the blog. I dont know what happened to Tilsen, he was going to try and make his way back to Colombia. Although things were not so amiable between Jose and the rest of the passengers when we left the island, I hope that he is doing as well as can possibly be after losing something that I know meant so much to him. So for all those other travelers reading my blog who are thinking about doing the trip from Panama to Colombia by boat, the lesson to be learned here boys and girls is don’t cheap out. Either spend the money to go with a reputable captain who is known in the community and has a track record, or fly. Or in general if you are going on a tour of any kind where there are risks involved, find out as much as you can about the safety record of your operator, make sure they have the right equipment, working radios, maps, charts, etc. Well, I know I’m way behind in my blog and I still have to report on lots of things that happened before the shipwreck…eating bugs and finding fossils in Santander, going deep into the Amazonian jungles of Peru, vacationing in Colombian hospitals, and motorcycle riding in Medellin and the surrounding mountains. This is all to come on the blog (And has already happened), but I though the shipwreck story was one that should be told sooner than later. Well, thats all for now folks! Smooth sailing to everyone. This entry was posted in Uncategorized and tagged adventure, cartagena, central america, Colombia, indians, island, islands, kuna, kunas, mauki, morotup, panama, reef, sailboat, sailing, sailing from cartagena to panama, sailing from colombia to panama, sailing from panama to colombia, san blas, Shipwreck, shipwreck story, shipwrecked, shipwrecking, South America, travel, traveler, traveling on June 27, 2011 by Jordan.